One of the most underappreciated heavy tanks, the M103 can pose a serious threat in the right conditions.The fully upgraded 120mm cannon is a fantastic gun, with great accuracy, and very high penetration. 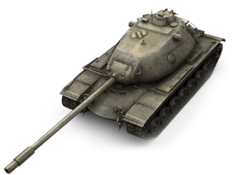 While it lacks alpha damage compared to the IS-8 or E-75, the gun's reload speed makes up for its lack of damage. 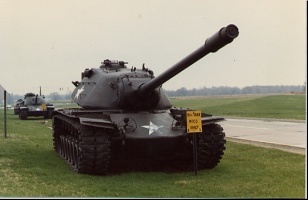 The M103's oddly shaped hull and well-sloped turret can make this tank a bit tricky to fight, especially at long ranges; however, this tank suffers from having very weak side and rear armor. When fighting this tank from the front, make sure to try and hit the lower armor plating as hitting the upper hull will most likely bounce. If you can only see the turret aim for the large cupola on the top of the tank for easy penetrations. The speed and maneuverability of this tank are quite good, so it's able to keep up with the rest of the team and provide excellent fire support when needed, and is able to turn its frontal hull towards the enemy quickly to reduce damage taken from incoming fire. This page was last modified on 14 April 2018, at 08:47.